As this component does not display the related value directly I decided to provide a protocol for a delegate to inform about slides and value changes. Furthermore I had several situations I could use the slider control where the values get handled in different ways. So I decided not to create a component that handles a specific value and offers this value directly, but use the component as trigger for a delegate that reacts on the slide or the button taps. As you can see the component is derived from UISegmentedControl such that all the methods of a segmented control can be used, even the different layout styles. You can define a slide threshold (3px by default) that specifies how many dragged pixels trigger one step up or down. Furthermore you can define by the slider segment index which segment is used for sliding. By default the center segment (or right to center for even segment amount) is used. This example already contains two slider controls and a label for each to display the current value. Furthermore an action is required for each slider. This methods get called when one of the slider’s buttons not used for sliding gets pressed. The steps value is always positive and depends on the dragged distance and the slide threshold. 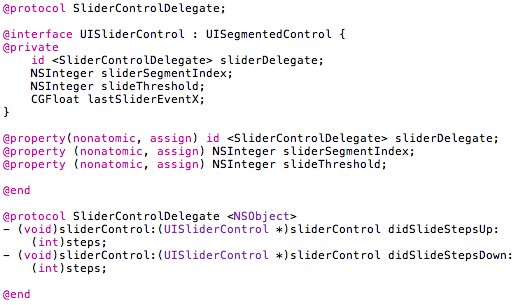 If you use more than one slider control in one view controller you can use the slider control attribute to check which one did call the delegate. To use the slider control in your project just drag and drop the group “SliderControl Sources” into your source tree. After dealing with some problems to add a single button as titleview of a UINavigationbar I decided to provide a small component to handle this scenario. There are several examples available showing how to add a segmented control in the center of a navigation bar, but as a segmented control has to contain at least two segments a single button could not get covered with that approach. The button gets allocated and initialized with an image and a selector that is called when the button gets pressed. The style attribute defines if the button is black or gray. The value can be read from the related navigation bar. After that the button instance gets assigned as title view of the main view’s navigation item and gets released. To get the example working “UINavbarButton.h” got imported before. To use the button in your project just drag and drop the group “NavbarButton Sources” in your source tree. Songtronome v1.0.1 has entered the review process! As iOS 4 came out some things changed and so the Songtronome app had to change, too. Unfortunately I had to head some other things, but now I found some time to fix the problems and submitted a small update to the App Store. Besides being ready for iOS 4 there will be a really cool new icon made by my friend Carlo from form one in Hamburg, Germany. Songtronome is ready for sale!